Mike Lobanov is a partner at Target Global. In October 2016, two leading P2P platforms in the U.S. — Lending Club and Prosper — announced a new increase in interest rates for lower-grade loans. The decision was made in order to sustain investor demand, as the model platforms are operating under challenges faced during the last months due to compliance issues with Lending Club and the general turbulence of the P2P lending industry. However, keeping the investor demand stable is not the only reason for recent changes — as Lending Club announced, delinquencies are growing, especially when it comes to high-risk loans. October 2016 was not the first time P2P platforms changed their interest rates that year. Initially, the decision was caused by the Federal Reserve to raise interest rates in response to signs of a stable and strengthening economy in December 2015, following a period of low rates designed to promote quicker economic growth in the U.S. and worldwide after the financial crisis. Back then, Lending Club responded by raising interest rates for new loans by an average of 0.25 percent to match the Federal Reserve’s move. During the last year, both P2P platforms were changing rates several times. The tables below demonstrate cumulative changes in interest rates for Lending Club and Prosper. Although the rate for high-grade loans for Lending Club has slightly increased over time, while dropping a little for Prosper, the tendency for both companies is similar: They are widening the gap between low and high-grade borrowers. The most significant change was attributed to high-risk loans of Lending Club — as can be seen from the table, the rise was more than 6 percent for F-grade loans originated by the company, compared to just 0.2 percent change for A-grade loans. The measures taken by Lending Club and Prosper resulted in a lot of discussions dedicated to the topic in the press. Some of the observers even consider this to be a sign of imminent recession. However, financial markets, which can be considered a good indicator of the overall economic situation, are not pricing in a recession, with credit spreads tight and equity high valued. The same refers to other indicators, such as unemployment, industrial production and capacity utilization, which are also stable and have even improved in the last years. At the same time, there are several convincing opinions for the recession, with one of them discussed on Seeking Alpha. The article analyzes the behavior of U.S. consumers deeply, with the main idea of the market materially mispricing the strength of U.S. consumers, whose weakness will lead the U.S. economy into a recession in Q1 2017. The author states that the misconception of unemployment and average hourly earnings connection exists on the market due to top 20-40 percent of earners accumulating the majority of consumption. Since 2013, the top 40 percent of earners have accounted for 84 percent of all new income and 34 percent of new debt, which led to a material reduction in aggregate leverage relative to income and provided for consistent growth of retail sales, as this cohort represents 65 percent of total consumption. According to the article, the recession will be a result of a material reduction in consumption from these top earners, who have historically followed the deterioration of lower and middle-income households. Those involved in tech, software development and servicing will accumulate the majority of wealth. I do not support the view that the recession is coming in Q1 2017, but the increasing inequality in earnings and accumulation of debt by the poorest part of the nation is worrisome. Although all of the arguments seem to be justified taking into consideration the evidence provided, we suppose there is a deeper reason that could explain the existing tendency of increased delinquencies and widening gap between rates for low and high-grade loans. We tend to believe there currently is a fundamental shift in the economy happening that leads to it. With the penetration of technology, more and more labor-intensive work is shifted to computers or machines. People employed in manual labor, who mostly get an hourly wage, are in less demand on the market, which leads to the number of such jobs decreasing. Most jobs that were previously done manually are being substituted by machines, which, accordingly, increases competition among workers of respective industries. The statement is easily supported by the last data available: A new study by Forrester forecasts that cognitive technologies such as robots, artificial intelligence, machine learning and automation will replace 7 percent of U.S. jobs by 2025 (with 16 percent of jobs replaced and the equivalent of 9 percent jobs created). Actually, the new era of machines is already here — e.g. driver-less car technology is already on its way to reducing labor costs, fuel costs and accidents, but at the same time become a nightmare for bus and cab drivers and truckers. 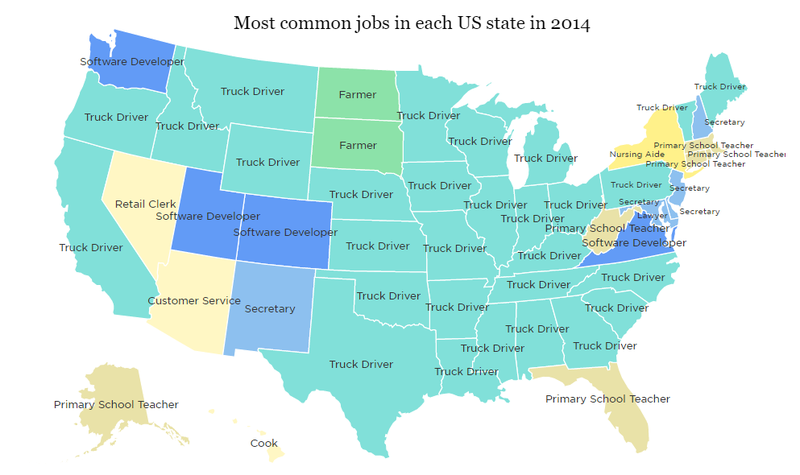 Taking into account that, according to NPR data, truck driver is the most common job in the U.S. as of 2014, overall, the economy will get slammed by the automation of jobs, although it could take several years before they will finally be replaced. By the end of 2016 there were more than 4.1 million people who drove for a living, with more than 3.5 million doing it full time. The automatization of driving will lead to all of them being forced to change their jobs, and obviously turning to software and tech industries is not an easily affordable option for these people. 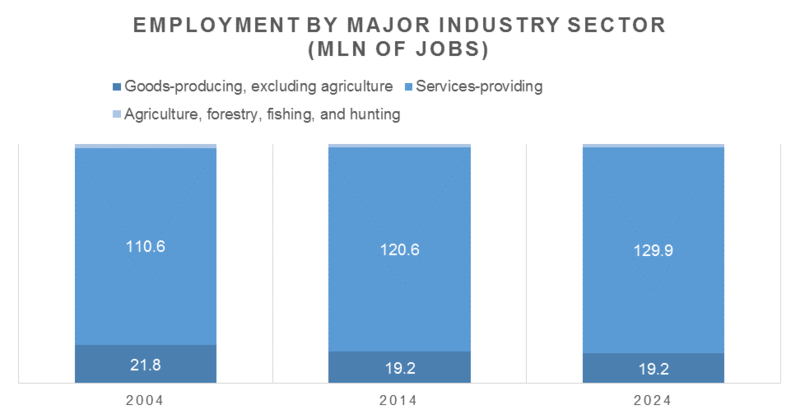 Talking about the economy as a whole, in December 2015, the Bureau of Labor Statistics published a report dedicated to employment in the main industry sectors. The bureau provided its long-term projections on the split of employees in different industries based on the historical data. The results are presented on the diagram below — as can be seen, services-providing sectors are expected to grow and account for the majority of jobs, while goods-producing sectors have shown a decline in the last years, with the situation not expected to change substantially in the future. The research, again, supports the thesis of increased competitiveness among workers in labor-intensive sectors. Employment in the tech industry is, on the other hand, quickly growing. According to the results of a Cyberstates 2016 report prepared by nonprofit IT trade association CompTIA, employment in tech hit its highest growth rate in more than a decade in 2015, reaching 6.7 million people for companies with formal payroll in place in the U.S., up about 200,000 from the year prior. CompTIA’s report lists the growth of tech employment at 3 percent YoY, compared to the national employment growth average at 2.1 percent YoY in 2015. The growth was led by IT services and followed by engineering services, R&D and testing. The table below provides more statistics on the topic. The rise of employment in the tech sector is combined with growing wages for tech workers. In 2015, a Dice.com survey reported that 72 percent of employers wanted to hire at least 10 percent more tech staffers. The average salary in the tech sector rose almost 8 percent in 2015, to $96,370, which was pointed out to be the most impressive growth in salaries ever. The same is happening with bonuses of tech-professionals — in 2015, 37 percent of IT employees received a bonus averaging $10,194, a 7 percent increase over the year before. Talking about highest-earning skills, the answer is again in tech — the highest salaries are clustered around big data analysis. The graph below is an example of growing wages in tech industry for Austin employees based on the results of a Dice online survey carried out in October and November of 2015 with 16,301 respondents. The overall increase in wages since 2007 reached 29 percent, corresponding to 3.7 percent CAGR. Summarizing the above, we can expect that for workers employed in labor-intensive industries, the wages are not going to rise as a result of increased competitiveness for jobs in these sectors. Stagnating wages will lead to credit of such workers suffering (which is, in fact, already happening), as their anticipated increase in income is not realized even when the economy is doing well in general. At the same time, the opposite is happening with tech industry professionals — the significant increase in wages and incomes leads to their credit performing better, respectively. This points us toward a conclusion that there may be a huge wave coming that has not yet been noticed: Those involved in tech, software development and servicing will accumulate the majority of wealth, with those working manually suffering from increased competition and decreased demand for their skills. As a result, the gap in income between two social groups is going to widen even further, which presents a challenging problem for today’s economy. Tech industry workers are likely to become a privileged population segment accumulating most of the consumption, leaving workers employed in labor-intensive industries behind. We suppose that the market should be prepared for significant underperformance of loans and further increasing delinquencies as a result of the poorer segment being unable to repay debts because of stagnating wages, which means that moving down along the credit spectrum should be done with great caution. In fact, we already see sub-prime segment credit quality deteriorating — CircleBack Lending, focusing on sub-prime loans is out of business with its securitizations performing worse than expected, and sub-prime auto loans defaults are mounting. And as tech advances, I am sure there will be many more to come.